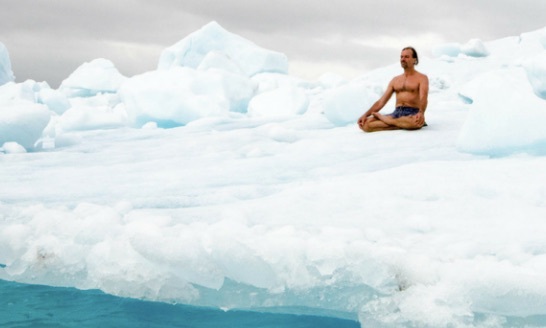 Hof attributes his success to what he has dubbed the Wim Hof Method, a type of conditioning that involves a series of breathing exercises he says anyone can replicate. Rather than by luck or accident, Hof says he learned his technique by trial and error while going out into nature: “I had to find the interconnection of my brain together with my physiology...."
Musik found that, when exposed to cold, Hof activates a part of the brain that releases opioids and cannabinoids into the body. These components can inhibit the signals responsible for telling your body you are feeling pain or cold, and trigger the release of dopamine and serotonin. The result, Musik says, is a kind of euphoric effect on the body that lasts for several minutes. “Your brain has the power to modify your pain perception,” he says, adding that this mechanism is particularly important for human survival. Pain, and the feeling of cold, are basically your body’s way of telling you something is wrong. Since humans instinctively look to remove the source of pain or alleviate any sensation of cold, feeling hurt can help us survive.